We sit in the fading light of a glorious spring day. Glowing yellow sunlight bounces off the warm beige walls of the condo. Sue lights the candles on the coffee table then reaches above the fireplace to snap on the Christmas lights that she and her husband Charlie have yet to take down. The colorful bokeh casts a twinkling halo around her blonde, pixie-like head. “Red or white?” Charlie asks our friend Yvonne as she grabs a seat on the sofa, her flowing blouse settling in around her. She has worked all day at her gift store and is happy to relax among friends. “Red,” she answers and Charlie bends his tall frame to reach down and pour some wine in her glass. Joan and Jane steam through the door, a whirlwind of coats, voices, boots and dogs. Joan looks better than she did a half-hour earlier. I left her at her house in pawprint-stained sweats, her graying hair in disarray. She has showered, pinned her hair back and stained her lips with a cheerful smear of peach lipstick. She takes her chair like a queen holding court, suddenly calm and poised. Staring at her square shaped face, which bears more than a passing resemblance to Joanne Woodward, it is easy to envision her in one of her past lives as a model, a role she held in New York City in her younger years. Jane hovers, slightly hunched, in back of her, peering at us from behind coke-bottle glasses. In her flowered dress and brown bobbed haircut she looks strangely childlike. Both eschew the wine in favor of water and with the niceties complete, Charlie takes his place on the other sofa, closing our circle. Then as if drawn like magnets to fill in the holes, we are barraged by pugs – a small fawn and black army of compact, but solid bodies that feel like heavy sacks of flour landing on our laps. We move and adjust our bodies to make room for them. A very pregnant Truffles hoists her seal-like form to the top of the sofa, resting her head near her owner, Charlie. Chunky, the furry senior, curls up in the unclaimed loveseat. Lily, Josie and Miska circle their mama, Yvonne. Jerry, the grand old dame, hides in the corner. Lorelei, whose legs are starting to wane, shuffles over to Yvonne, placing her head squarely in her lap, begging for attention. The youngster, lanky, black Goofy, bows to whoever will humor him, hoping for play. He is one of the puppies from Joan’s last litter and we have gathered for a reunion to see him again. Joan has brought his mother Griffles, grandmother Releve, and handsome brother, Gryffindor, who also scamper and scurry around the floor. Sweet Pea, another old girl, sits erect on Joan’s lap, as regal as her mistress. The pugs are so plentiful I have lost track of their number. Jane has left Shim and his dogcart in the car. I survey the room and grin at the lot of us. 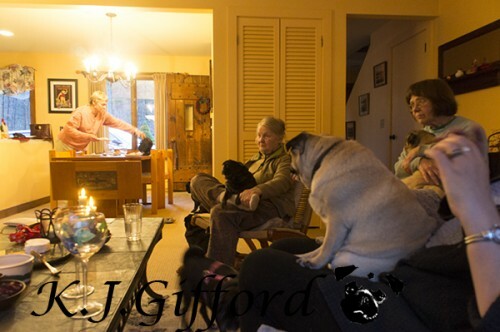 Charlie, Sue, Yvonne and I sip wine from fine goblets and nibble on the spread of cheese Sue has placed before us, while the pugs chew on the wine corks, try to sneak a bite from the table and occasionally piddle on the floor. We chat about the Boston Marathon bombing, Charlie and Sue’s grandchildren, condo fees, and pug ailments while attempting to keep the dogs corralled and the carpets clean. “Do you think we need a couple of more dogs?” I joke. Everyone smiles. 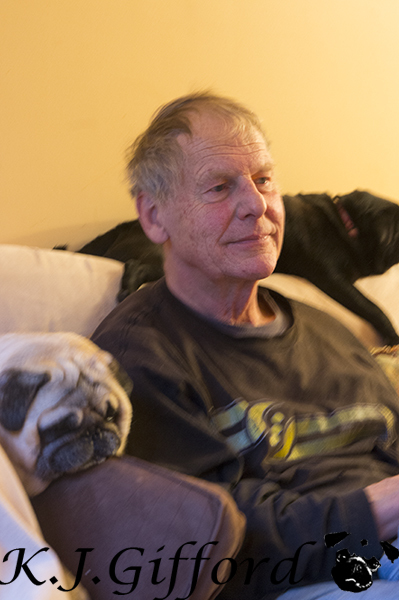 We would not know each other if it were not for the pugs in this room. I’m not sure how we would have met otherwise. We encompass different generations, have varied backgrounds and live in different states and towns. But we are now going on a decade or more of gatherings such as this one. We have become a comfortable pack. The room fills with it. I have heard the belief that we live in an ever-increasing age of isolation, turning to our pets to fill the void vacated by humans. There may be times when this is true, but I feel none of that here. I see friendly faces both canine and human. Charlie and Truffles rest eyes half-closed, mirror images of satisfaction. Joan, Jane and Sue giggle as Yvonne shares with them dog videos on Charlie’s i-Pad. I bask in the friendship. It’s true as a single woman I know my share of longing and have some voids to fill, but I have no need of substitutions. I am part of a tribe and its members have both two legs and four. This may not be a dinner party for everyone, but it suits us just fine. Like a dog chawing on a bone, we find ourselves perfectly at peace.